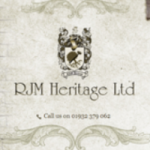 RJM Heritage Ltd are specialists in the maintaining and restoration of historic buildings. We only use traditional methods and materials like lime render and lime mortar. If you are in need of our services please contact us today.